Yesterday I shipped my latest commission off to it's owners in Wisconsin. It was a joy to paint a paint! (Okay... my little attempt at humor.) The clients sent good references from which I could work. I never did have the opportunity to meet this horse in life....but he sure does look like he's got personality plus. In the perfect world I get to meet all of my subjects in life...but sometimes that's not possible and a combination of various photo references can work well to achieve the final painting. So, here's to "Tex" and his new home. saying "who me?....I'm not eating your hostas". ( I'm thinking this will have to be a painting at some point !) For many years we never saw deer in our backyard...until hubby started gardening.....then here they are visiting and looking for those nice green tomatoes. A friend suggested that you simply plant a big enough garden to feed yourselves and the animals ! Good advice I think except that it's going to have to be a very big garden. Nashville historical site. It being steeped in thoroughbred history....well what's not to like? The photo shown here is from the 2011 Derby Day Party centerpiece at the carriage house. The grounds are dripping with beautiful southern charm. If you live in the greater Nashville area and haven't taken the tour of Belle Meade, add it to your list so you can appreciate the gem that is in our midst. 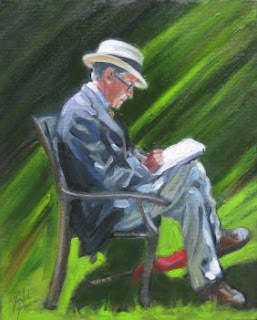 Happily I can say that last week the manager of the Belle Meade art gallery asked me to have another solo show in May of 2012. I'm thrilled to look forward to that opportunity again. 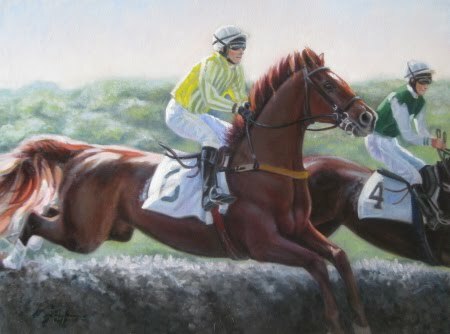 A year can go way faster than we ever expect....so I'm already planning my Steeplechase and foxhunting themed paintings....on that note, I'd better get off the computer and back in the studio. Steeplechase Horse of the Year 2010, "Slip Away"
Shown here is the Steeplechase Horse of the Year for 2010, “Slip Away” owned by Mr. and Mrs. Kenneth Ramsey with Paddy Young riding. 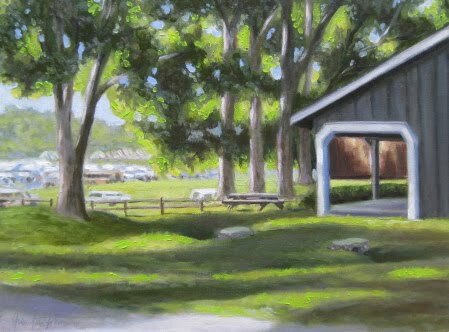 Although this painting ( 20 x 24 Oil ) was not finished in time for my recent show at Belle Meade Plantation’s opening night…I did have it hanging there for much of the month of May. I had the pleasure of meeting Mr. Ramsey and his son Jeff and grandson William at the Iroquois races this year. You could search the world of horses far and wide and never meet a nicer person than Ken Ramsey. In the words of his secretary……”he’s never met a stranger”. How lucky I was to meet him and have a chance to work with him on a commission. Happily I’m celebrating the month of May with another solo exhibition at Belle Meade Plantation’s art gallery. The opening is Thursday, May 5th from 5:30 -7:30 . Belle Meade is located at 5025 Harding Pike in Nashville, TN. The art gallery is located within the visitors center. There will be a wine tasting and hors d’ oeuvres. Also… I’m excited that Walter Durham will also be there signing copies of his latest book “History of the Southern Grasslands”. I have friends who are too far away to make it to the opening and so for that reason I am posting some selected paintings from this Steeplechase inspired show that are not yet on my website. Look back a few posts and you will see some paintings that I’ve already posted that you will also see there……. “I’ll bring the flowers, The Lipizzaner, Zenyatta, Bubble Economy, and study of Cuse. Last year I was in seventh heaven having a press pass to the Iroquois enabling me to take much better reference shots than I could have gotten otherwise. I was trying to stay “out of the way” of the business of the trainers and grooms while still gaining access to some wonderful shots. 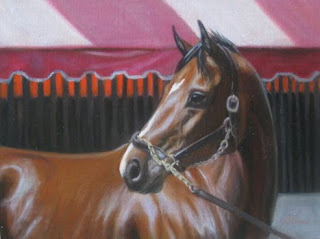 When I arrived in the morning , one of the first horses that came into my view at the barn was “Birthday Beau”. He was grazing with his handler, had finished a bath and was drying off in the sun back by the tents. 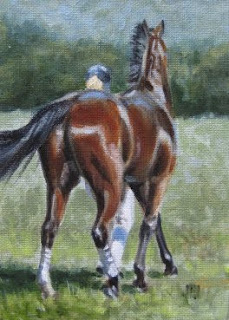 I have loved and observed horses all my life, but the sight of a thoroughbred glistening in the sunlight will always take my breath away every time. His owner, trainer, Michelle Sanger could not have been nicer to me chatting for a few minutes despite the activity of race day ! No wonder Beau looked so content and happy that morning. So, here is “Birthday Beau”, oil, 9 x 12. 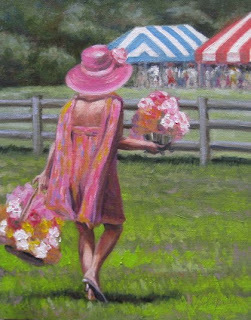 Belle Meade Plantation Art show continued….. If you saw my show announcement that came out …you saw the painting of “Chess Board” oil, 9x 12 on the front in black and white. Here’s the real thing in color. Again it was late afternoon and the sun was shining on the horses cooling off back at the barns. Chess Board’s groom was giving him sips of water every turn around the paddock and whenever he would take a sip he would swing his head up and look into the distance as if there was something really interesting out there. I would love to know exactly what was in his mind. was balanced by a wonderful shady calmness back at the barns in the afternoon. That’s what drew me to paint this little landscape of the view from that spot. Okay…a little departure from the horses for a minute…. “Sunshine Fox” oil, 8x10. This was one of my fox friends that lived outside our fence last year and sometimes would venture out in the full sunlight and lounge around our yard right outside my studio window ! I think this was the split second before he realized that someone was watching. I loved the light on that ochre/orange color coat. 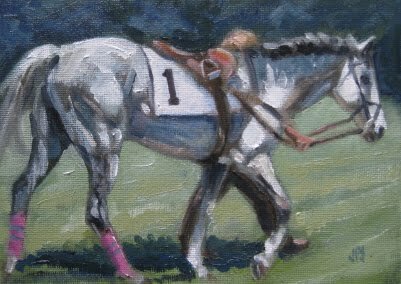 Humans deserve a little attention for Race day and here is a painting entitled “The Starter” 10 x 8 oil. I asked his permission to shoot his picture with the idea that he may wind up in the show this year. His demeanor exuded experience and confidence in the job at hand. The red starting flag rests under his chair as he looked so very calm and relaxed amidst the frenzy of activity all around. I couldn’t help but think that nothing happens on race day without him . My last selected painting to post here is “Sunshine Numbers Cooling Off “ 9x12 Oil. Wandering behind the scenes that day I caught a glimpse of Sunshine Numbers having a cooling drench behind the barns. I wanted to capture the water spraying and the reflections on his coat. The fact that it is downright cute that he is catching a few drops to drink was irresistible. I know horses do that all the time but I never get tired of seeing it. See you at Belle Meade ! WIP for "I'll Bring the Flowers, Iroquois Day"
When I started this blog, one of my intentions was to post some WIP or "works in progress" shots that I snap from my easel through the process of a painting. This is the first one that I have actually posted. I start out with good intentions of making a chronicle of the progress of more of my paintings. I'll get the first few shots and then get so into the painting that I forget all about shooting more and then... oops...it's done. I'll have to work on my system for remembering to snap pictures more often! 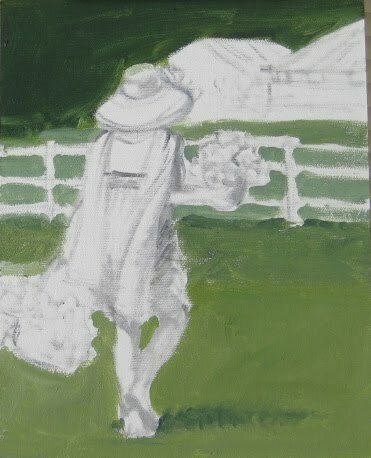 Here is a short progression of an 8 x 10 painting entitled "I'll Bring the Flowers". 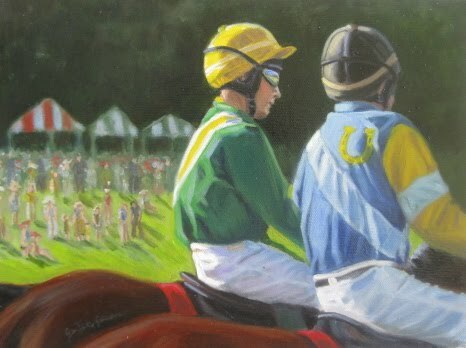 It was inspired by one of the stylish attendees of the races on Iroquois day at Percy Warner Park in Nashville. 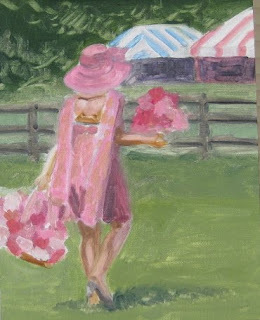 I loved the pink of her dress against the green of the grass. 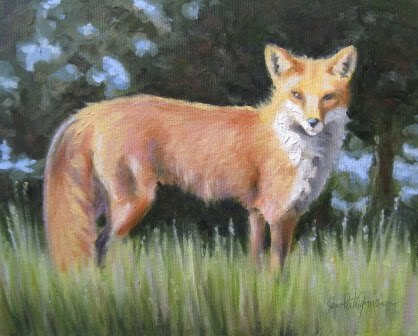 (This painting will be included in my solo show at Belle Meade Plantation's Art Gallery this May.) Most of the work at the show this year was inspired by the sights of the Steeplchase Races on Iroquois day in 2010. 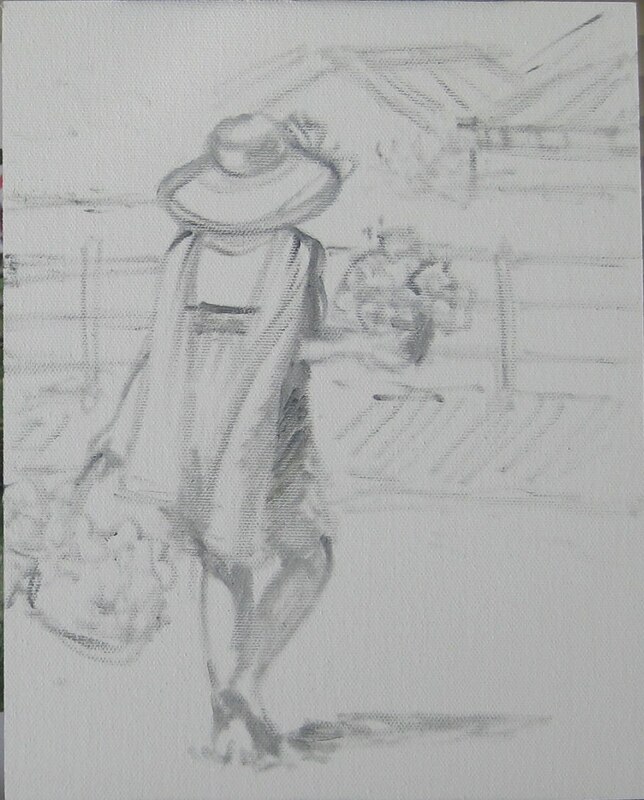 I did this sketch with a mixture of burnt umber and ultramarine with a medium/small sized brush. No pencil drawing..dove right in with the paint, tried to keep it sketchy but proportional. When the canvas is small I will usually start right in with paint and "draw" with the brush... actually, I have been starting out that way more and more lately even with my larger canvases. It helps me think in terms of blocking in masses more than getting too bogged down with a linear approach. The next shot shows a general blocking in of the value of the green trees/grass of the background. I usually start with a toned canvas, however I did not tone my canvas on this one because I wanted the white of the canvas to help the brightness of the pinks and pastels of the dress. Blocking in the local colors gets paint all over the canvas and starts to generally show my values. I'm not worried about the details at this point...mostly working on values. 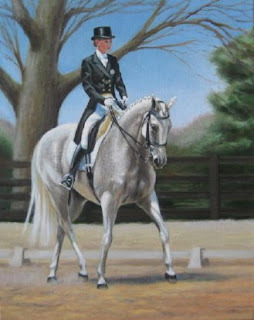 The final painting shows the result of refining the drawing. The temperatures and values of the colors have all been pushed and pulled to this point. I will set this painting aside in a place where I'll see it everyday and with a fresh eye....then I'll know if it's truly finished. Here is one of the paintings that I finished over the past months. 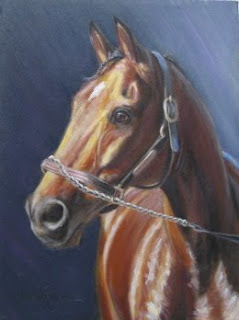 I've wanted to do this one for a long time so I could take a beautiful horse such as this and play with the light. 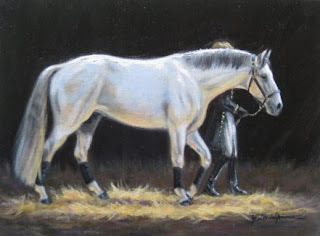 Of course the stage at the shows have no straw down....but I wanted to imagine this beautiful horse walking across the warm reflected light from the straw and the cooler flood light from above and just go with that imaginary place in this painting.... I imagined the two walking backstage toward the curtains leading to the performance area. Yes, I know that straw all over the floor is probably not reality behind the curtains either....that's where I claim artistic license :-). It's been a year since I saw the Lipizzaner stallions in Nasvhille....waiting patiently for them to come through town again! This past weekend was a success at the Webb School's Art show in Knoxville. 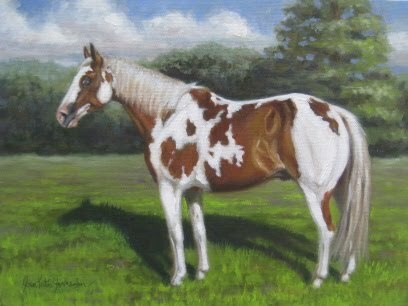 I met some wonderful East Tennessee horse owners and really look forward to completing some commissions that were a direct result of participating in the show. This past month I was happy to add another Gallery in the middle Tennessee area to represent me and my paintings. 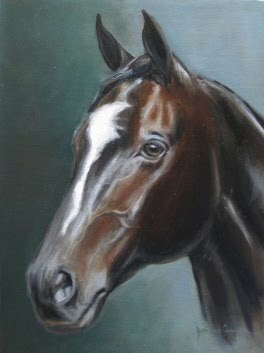 Right now you can regularly see work of mine not only at Gary Tisdale's Midtown Gallery in Nashville, but at Bethany Laurel Reiser's Laurel Leaf Gallery in Leiper's Fork TN. If you are not familiar with Leiper's Fork...well, it's a gem of a town and takes you back to a slower paced time and place. The horse farms that line Old Hillsboro Road out to Leiper's Fork are a beautiful site to behold and is one of Tennessee's scenic byways for sure. Another plus is that Leiper's Fork is close to the Natchez Parkway. Laurel Leaf has wonderful jewelry and gifts along with a dedicated gallery area and is located on the first floor of a building that fits right into the original structures lining the main street. Have lunch at a number of quaint restaurants in the area such as Joe's Natural Bakery and Cafe ( for all you locavores ) or Pucketts Grocery. Looking for a great Saturday drive and relaxing afternoon....Leiper's Fork is the place for you. Shown here in pictures is my wall at Laurel Leaf that will change out periodically. Also, a view of the front of Laurel Leaf with the proprietress, Bethany on the porch. fresh air just thinking about it! This weekend I'll be at the Artxtravaganza Art show at the Webb School of Knoxville, TN. It's the first time I've been invited to this show and I look forward to meeting lots of new people from the area and maybe a few horse lovers will find some time to stop on by. Shown here is a painting that I will be bringing to the show entitled "Warm-up at Rolex", a 16 x 20 oil on canvas. It's been a wonderful time to be working in the studio with all the glorious winter wonderland views out the window. But I'm ready for spring. I have a lot going on as far as paintings go and have been racking up some major hours working on new pieces headed for my galleries this spring. Here are a few studies that have just been finished. One is of course the great "Queen Z" Zenyatta. I need more head shots in my portfolio and I thought that she was a great candidate since she has that beautiful dark bay coloring and wonderful ice cream scoop blaze down her regal face ! The fact that she was the The horse of the year for Thoroughbred racing in 2010 is also a plus! The other two paintings here are small studies, only 5 x 7 and were done to see if I may like to paint larger pieces. 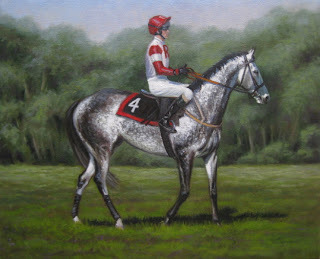 They were both inspired by my day at the Iroquois races in 2010. 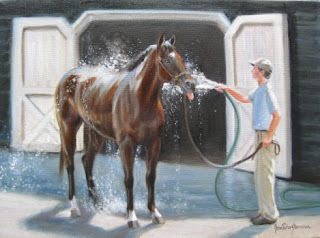 One shot was of "Bubble Economy", headed back to the barns after winning his race and being thoroughly doused with buckets of cool water after leaving the track. What a beauty. I loved the way the light was dancing all over the grey coat of "Cuse"...a steeplechaser that raced that wonderful sunlit day in Percy Warner Park. More pieces to come as the spring days move closer! When I do these small studies....I like to use a method that was used in some landscape workshops I've had in the past. Obviously painting from life is the best option. But with animals.... it is not always practical for reasons you can imagine...like they are rarely still. So...my own photo references help me to at least remember the basics of the pose I would lke to do. I'll take some prints or shots on my laptop screen and place it next to my easel and paint as if I were standing there looking at the real thing. I know that photos distort and blend the values in the lights and the darks. Those are the kinds of observations that I try to make sure that I take note of when taking the shots. I can paint the things into the painting that aren't readily seen in the photo....but I remember those cool and warm shadows and can pick and choose about my edges and what I want to emphasize. The best thing about this is that with every painting, my drawing skills get a little sharper. 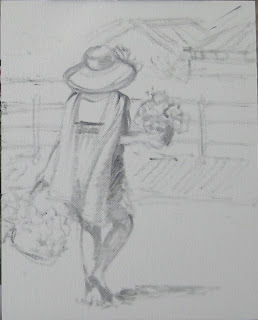 I don't use a pencil at all anymore to start these smaller paintings on the canvas, rather I draw with the brush from the beginning. I've been drawing all my life...but I believe it is a "use it or lose it" skill. I DO NOT use a projector or trace anything from the photos and these little studies are great for sharpening observation and drawing skills. With every small study I do...if I choose to make a larger work from that study...I've already drawn it once and it is easier then to draw it larger...since I've already made some mistakes and learned from them. So these 5 x 7 studies help me to draw/paint what I see...as if those wonderful thoroughbreds stop and pose just for me.